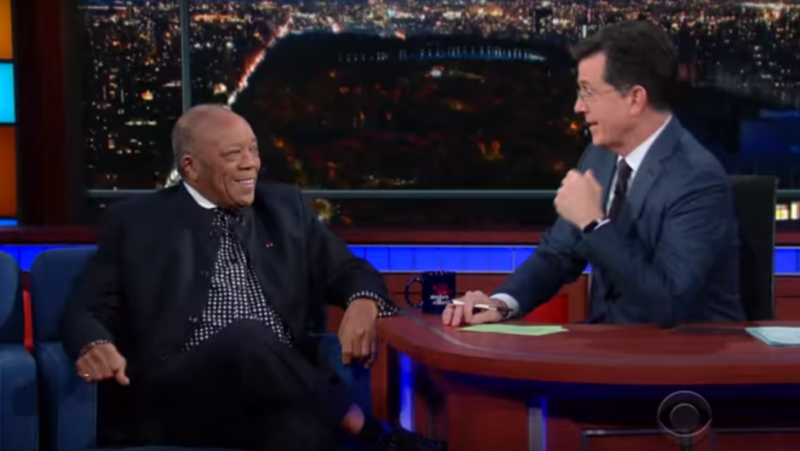 Jones on The Late Show with Stephen Colbert. You can make a convincing argument that Quincy Jones is the biggest name ever to come out of Bremerton. The legendary musician and producer spent his teenage years here, and, most notably, discovered music on the shores of Sinclair Inlet. Though born in Chicago, Jones’ family moved to Bremerton in 1943. I always enjoy hearing him tell stories about the city, and he did so most recently on CBS’ The Late Show with Stephen Colbert. In the interview, the host asked Jones — winner of 27 Grammy Awards — about the first instrument he ever played. Jones mildly exasperated Colbert by avoiding answering that question for some time, instead focusing on his “gangster” youth. But Jones does indeed get to his Bremerton days. What I find delightful is he just says Bremerton, like everyone knows what he’s talking about. He quickly elaborates that it’s a city within Washington. But I think it speaks to his roots here, that even beyond his time in Seattle, Chicago and elsewhere, he would still mention our city without a state attached to it, given his familiarity and memories of the place. He goes on to tell the story of being in an armory here where there was rumors of lemon meringue pie and ice cream cones, which he and his “gangster” friends promptly ate upon discovering them. “That sounds like gangster work my friend,” Colbert jokes. They also broke into all the offices inside. He mentions a Mrs. Arends by name, and it was inside her supervisors’ office that he found a piano. “I didn’t know human beings played instruments,” he told Colbert. Though he went to Coontz Junior High School near downtown, he studied music with band teacher Ron Gillespie, future Bremerton High School principal, at Dewey Junior High School (where Mountain View Middle School sits today). He would ultimately graduate from Garfield High School in 1950, according to Sun archives. Great video clip! It is so funny that he wanted to give some background before mentioning his first time playing the piano! Colbert did not understand why that “youth wannabe gangster” part was so important until Quincy Jones told why they broke into the Armory in Bremerton. That is the same Armory break-in story he has been telling for years! It is so nice that he remembers his time in Bremerton well enough to even mention it on The Late Show. Back when I was at Coontz Jr. High in the early 1970s, we folks in the band knew that Quincy Jones had once roamed the halls of our school. So, would that have been an Armory in the area of Pendergast Regional Park? It’s always great to hear how Bremerton is part of people’s story. I know how much I have gone through moving here when I was 19. Bremerton is an amazing place. I moved to Bremerton from Elgin Illinois on Feb 21 1999 when I was 19 and started a short lived music adventure I will never ever forget. I have lived in Bremerton the whole soon to be 17 yrs with a 3mo stay in Port orchard. Bremerton is very accepting and it’s love for art is obviously recognizable. Thank you Josh Farley for finding another interesting story. The armory was apparently up in Sinclair Heights, near where Pendergast Park is now. But you have still managed to share some great community history!